The Trimble Catalyst DA1 antenna and a selection of accessories can be purchased through your local Trimble Distributor. The antenna attaches with a simple push-fit to any 1 ¼ inch diameter pole or rod, or can be securely attached to any accessory with a &frac58; inch thread using the simple threaded adapter that comes in the box. Your antenna also ships with an external USB battery pack, custom battery mount, and a protective carry pouch. Other Trimble accessories as listed below can also be purchased to meet the needs of your application. Contact your Distributor to purchase. Depending on your application and Trimble Catalyst subscription, you will have different needs for how you mount your phone or tablet and your Catalyst DA1 antenna. There are many options on how to do this from third party suppliers, including RAM, SECO surveying equipment, and online vendors such as Amazon. Contact your Distributor for their recommendations and suggestions. Trimble Catalyst can run on compatible Android phones and tablets but due to the processing requirements may not work on older model devices. We have provided some guidelines below to help you understand if your device will meet the minimum hardware specifications. Trimble Catalyst connects to the DA1 antenna through the USB port on your phone or tablet. In order to power the antenna from your device's battery, your device needs to support 'USB-OTG'. If your device does not support USB-OTG, you can still connect and use Trimble Catalyst by powering the DA1 with the external battery pack supplied with your antenna. Android devices with a USB Type-C connector require a USB-C adapter to operate with Trimble Catalyst. Trimble recommends the Huawei AP52 Micro USB to USB Type-C Adapter (PN AP52-W-BK). To check if your device is compatible, download the Trimble Mobile Manager app from the Google Play store. The Trimble Mobile Manager app will check your device's performance capabilities against Trimble Catalyst requirements. For a list of devices that have been tested with Trimble Catalyst, view our tested devices list. Trimble Catalyst 1-Meter requires a correction service to deliver high-accuracy positions. Meter subscriptions make use of Trimble RTX technology, available nearly worldwide over a mobile data connection. Outside cellular coverage areas, Meter subscription corrections can be delivered by satellite. This map is a guide. 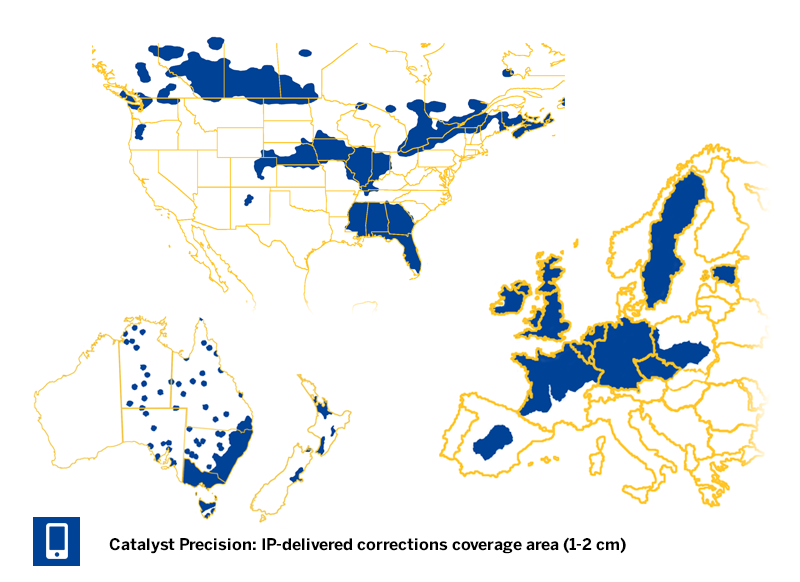 For detailed information on Trimble Catalyst correction service availability in your region, contact your local Trimble Catalyst Distributor. Trimble Catalyst Sub-meter requires a correction service to deliver high-accuracy positions. Sub-meter subscriptions make use of Trimble RTX technology, available nearly worldwide over a mobile data connection. 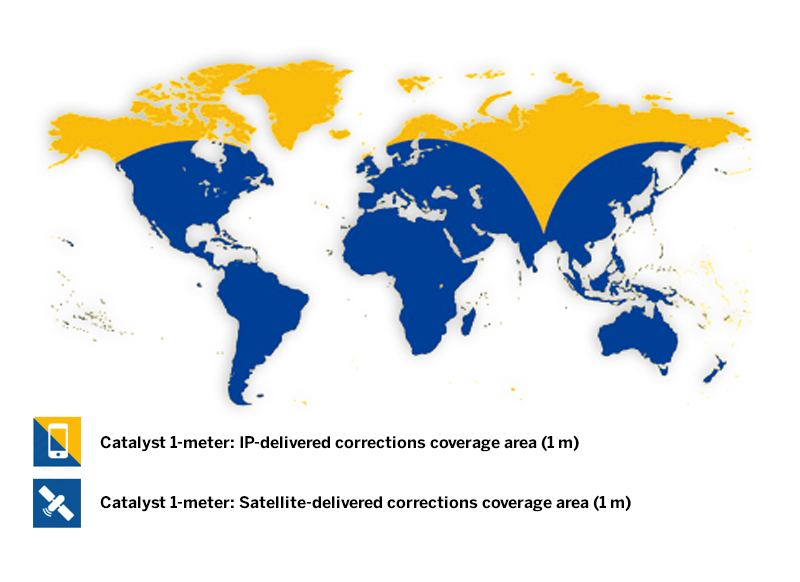 Outside cellular coverage areas, Sub-meter subscription corrections can be delivered by satellite. In areas supported with a regional ionospheric model and those inside Trimble VRS Now coverage areas, accuracies as low as 30 cm are achievable. This map is a guide only. For specific information on Trimble Catalyst correction service availability in your region, contact your local Trimble Catalyst Distributor. Trimble Catalyst Decimeter requires a correction service to deliver high-accuracy positions. Decimeter subscriptions include free access to the Trimble VRS Now correction service, available throughout the United States, Europe, and Australia, using mobile data delivery. Outside of Trimble VRS Now coverage, Catalyst also works with 3rd party local correction services utilizing RTCM 3.1 or higher. Outside VRS Now and local correction availability areas, sub-meter accuracies can be achieved. Trimble Catalyst Precision requires a correction service to deliver high-accuracy positions. Precision subscriptions include free access to the Trimble VRS Now correction service, available throughout the United States, Europe, and Australia, using mobile data delivery. Outside of Trimble VRS Now coverage, Catalyst also works with 3rd party local correction services utilizing RTCM 3.1 or higher. Outside VRS Now and local correction availability areas, sub-meter accuracies can be achieved.